Remember the Titans? The Navy does! The Navy last week officially welcomed its first Osprey tilt-rotor squadron to the fleet with a special ceremony at North Island Naval Air Station. Announced in August and officially established Oct. 1 as Fleet Logistics Multi-Mission Squadron - 30, it’s slated to fly the CMV-22B Osprey from the decks of the Navy’s flattops, part of an ongoing phaseout of the venerable but aging workhorse of carrier onboard delivery chores, the C-2A Greyhound. And now the new squadron has a name, the Titans. It’s the first Navy squadron to boast that moniker since 2001, when the Titans of Reserve Helicopter Anti-Submarine Squadron Light - 94 last prowled the high seas from the decks of frigates. Established in 1985, that squadron fell victim to both federal Base Realignment and Closure cuts and the Navy’s shift away from the SH-2F Seasprite and SH-2G Super Seasprite helicopters. 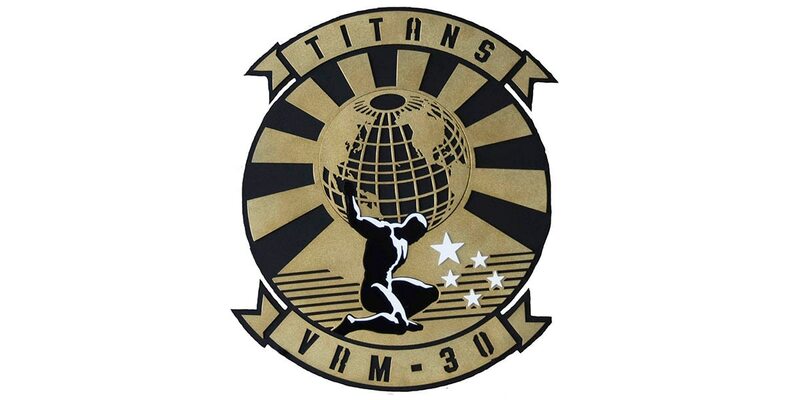 The new squadron’s crews will sport gold and black patches depicting a Titan carrying the weight of the world on his shoulders, plus five white stars gleaming nearby where he kneels. “Where no instructions existed, no patch existed, no ‘here’s how we are going to perform our duties everyday’ existed, this team will define that. And it’s exciting because we can establish right off the bat those best practices,” Vice Adm. DeWolfe H. Miller III, the “Air Boss” commanding Naval Air Forces, said, according to a Navy press release. The squadron still awaits delivery of their CMV-22B aircraft, the Navy’s version of Boeing’s V-22 Osprey that was originally designed for Marines. The Navy’s ongoing efforts to swap out its aging fleet of Greyhounds is going smoothly, even if the new souped-up Ospreys won’t be fully fielded until the mid- to late-2020s. Navy leaders expect a detachment from the squadron will deploy the following year on the carrier Carl Vinson, alongside the service’s F-35C unit, Strike Fighter Squadron 147. Based at Naval Air Station Lemoore in California, the Argonauts were deemed safe for flight operations this month and is scheduled to attain its IOC in February. 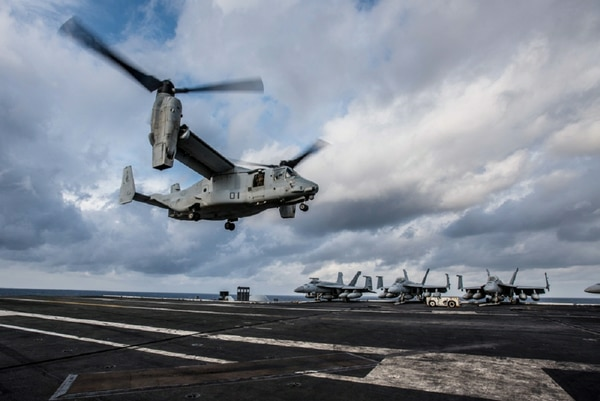 For the Navy’s CMV-22B crews, the Pentagon set up a Naval Aviation Training Support Group at Marine Corps Air Station New River in North Carolina, where the Corps trains their Osprey pilots. The Navy’s Osprey training eventually will migrate to North Island, too, but only after the service stands up their fleet replacement training squadron, Fleet Logistics Multi-Mission Squadron-50. The Navy has yet to announce that timeline. The Navy readies the new CMV-22s for carrier onboard deliver. The migration from the C-2A aircraft to the Osprey isn’t happening like most platform transitions in naval aviation, where squadrons directly adopt the new aircraft. Because of the smaller numbers of aircraft involved, the Pentagon decided that aviators and crews operating the C-2As will transition individually. And as Osprey detachments are created, their Greyhound counterparts will stand down. The Navy will permanently decommission all C-2A squadrons once the process is completed. The Navy will stand up Fleet Logistics Multi-Mission Squadron-40 in Norfolk and begin to phase out the East Coast Greyhounds in the same way. Officials hope to complete the total transition from the C-2A to the CMV-22B by the mid-2020s.